Super Spy 5Y-8R is an agent with American Intelligence. That really seems to sum up rather completely what we know about his work. It definitely looks like he works for America but that is not certain. He reports to headquarters somewhere but whose HQ is never mentioned. Is he in military intelligence as so many in his day were who had their exploits told in comic book format? Did he work for some known agency (well, at the time there were no known such groups except the FBI and the Secret Service)? There is just far too little to go on. The tiny bit of data we can glean from his adventures show he is intrepid (no surprise there), resourceful and determined. He is also athletic enough to handle himself in fist fights and to leap off a speeding and careening motorcycle onto the hood of an enemy motorcar. So add agile to the mix. Also toss in he knows his way around the water and he can ride a motorcycle pretty well. That our 5Y-8R in a very tiny nutshell. Or, as I implied earlier, it is our two Super Spy agents at work. It is hard to say and not really that important since after the second adventure, he (or they) was never heard from again. This comic came and went by so fast it is hardly worth noticing. In fact, with the first couple of pages of the second adventure unavailable to me, I cannot be absolutely certain it is a series at all. 1. 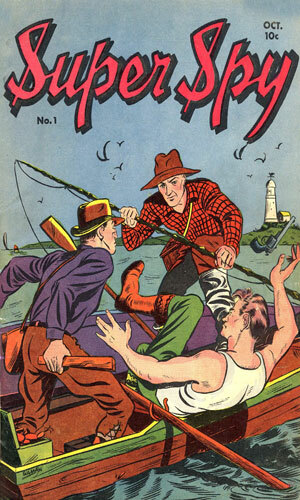 The magazine was named Super Spy. 2. 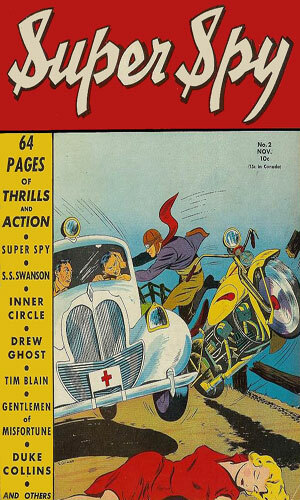 Both of the issues had the lead story be about a spy with the name Super Spy involved. 1. The first story had the agent called Super Spy 5Y-8R in the title but called just 5Y-8R in the prose. 2. The second story, whose first pages I am missing, is called Super Spy in the prose, but no mention of the 5Y-8R. 3. The spy in the first issue was dark haired. The one is the second was blond. 4. Each of the issues was likely drawn by someone else. So is it a two-story series? Who knows. And when you read the two stories, or what I have of them available to show you, I think you will agree you do not care either. From Super Spy #1 - Super Spy 5Y-8R is ordered to find who is behind the submarine attacks of American cargo ships a hundred miles off the coast. From Super Spy #2 - Super Spy (5Y-8R) is told to find out who is behind a series of leaks that are resulting in our planes going missing. The first page or so of the story is missing. Deciding whether to include this agent (or these agents) in the compendium took far more time than the matter really deserved. Two short, simple tales with nothing to hold on to or to remember. Artwork that was in one case, in my opinion, hardly worthy of being printed. I can see why the characters came and went so quickly. Why the magazine itself disappeared is a bit of a mystery. Did the publishers think the Super Spy name would be enough of a draw to bring the buying readers back for more? If so, it would seem they quickly changed their minds because they did not bother to try the third "charm" time. I do not blame them at all.